The crystal structure of calcineurin helps to define the different roles and mechanisms of action of the two structurally similar Ca2+-regulated proteins, CaM and CnB, in the regulation of calcineurin. 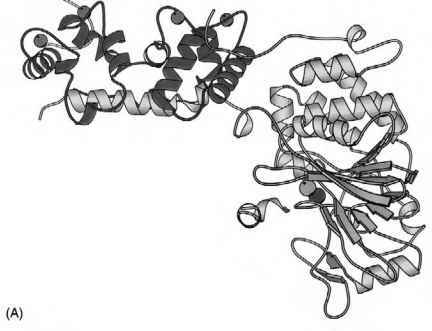 The catalytic center blocked by the inhibitory domain and the flexible calmodulin binding domain, freely accessible for calmodulin binding, is consistent with the widely accepted mechanism of CaM stimulation of CaM-regulated enzymes. According to this mechanism, binding of CaM results in the displacement of the inhibitory domain and exposure of the catalytic center . The requirement for Fe2+ (as opposed to Fe3+) for calcineurin activity explains the redox sensitivity of calcineurin activity in crude tissue extracts [13,14]. Crude and ascorbate-activated purified calcineurin is an Fe2+-Zn2+ enzyme with an optimum pH of 6.1 . 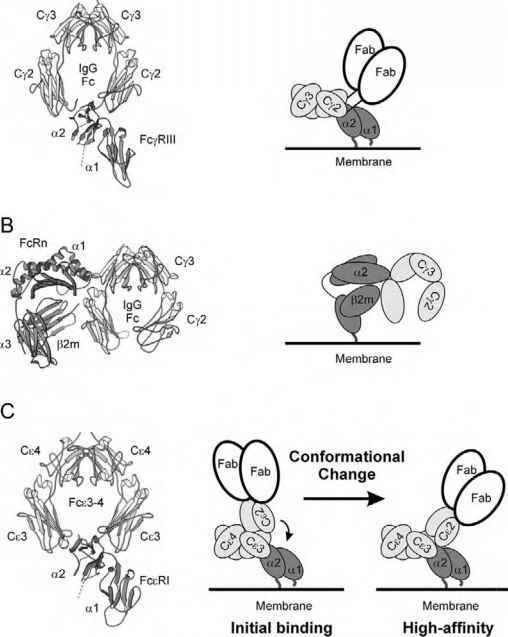 The Ca2+/CaM-induced exposure of Fe2+ facilitates its oxidation, which is responsible for the inactiva-tion of the enzyme. Partial depletion of iron and zinc as well as oxidation of the iron during the purification procedure are responsible for the low activity of the purified enzyme and its stimulation by 0.1-mM Mn2+ and 6-mM Mg2+ . CnB serves both a structural and a regulatory role. Ca2+-independent binding of CnB to CnA, mediated by the high-affinity C-terminal sites, ensures the folding of active enzyme [9,10]. Ca2+ binding to the N-terminal sites induces a conformational change of the regulatory domain resulting in the exposure of the drug and CaM binding domains [1,15]. The presence of anchoring and inhibitory proteins, for which expression varies from tissue to tissue, adds another level of complexity to calcineurin regulation. The PKA scaffold protein, AKAP79, anchors calcineurin to specific sites of action but also inhibits its activity (see Volume II, Chapter 185). Calsarcin-1 and -2, which tether calcineurin to a-actinin at the z-line of the sarcomere in cardiac and skeletal muscle, respectively, have been proposed to couple calcineurin activity to muscle contraction . Calsarcins interact with cal-cineurin close to its active site and inhibit its activity. What is not clear is how the Ca2+-independent binding of AKAP79 (KI=200 nM) and the inhibition of calsarcin are reversed. Cain/Cabin1, a 240-kDa nuclear protein of yet unknown function, has been identified as a noncompetitive inhibitor of calcineurin [17,18]. It is abundant in brain, kidney, liver, and testis, but is absent in muscle. In vivo binding of Cabin1 to calcineurin requires Ca2+ and PKC activity and is inhibited by FK506-FKBP, suggesting that it binds at the drug interacting site. A basic domain in the C terminus of Cabin1 has been identified as a calcineurin binding site . 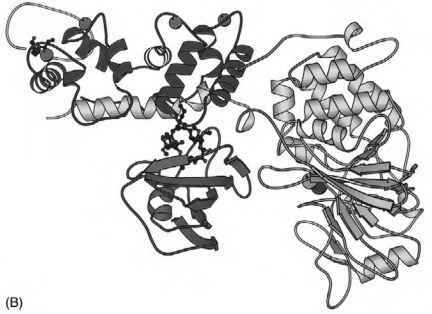 Figure 1 Ribbon representation of (A) the crystal structure of human recombinant a-calcineurin and (B) truncated calcineurin complexed with FKBP12-FK506. CnA is shown in light gray, CnB in dark gray, Iron and zinc are shown as light gray and black spheres, respectively. The four Ca2+ bound to CnB are shown as dark gray spheres, and FKBP12 is shown in dark gray. Myristic acid, covalently linked to the N-terminal glycine, and FK506 are shown in ball and stick representations (PDB code 1AUI  and 1TCO ). 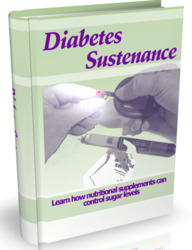 by a calcineurin/NFAT-dependent mechanism. MCPs inhibit both calcineurin activity and expression. They do not compete with CaM or FK506/FKBP but interact with calcineurin in a Ca2+-independent fashion through a highly conserved ISPPxSPP motif, similar to the SP motifs of NFAT; they inhibit calcineurin activity in vitro as well as NFAT activation in vivo.